Duex 2: Zero-Power to Fan Outputs. I recently bought a Duet two to add to my existing Duet Wifi. I am currently building a dual axis machine so I need the additional stepper drivers and the 12v fan outputs for my noctua quiet fans. My system runs on 24V. The Duex 2 is recognised by the DuetWifi and the steppers work fine however, I don't seem to be getting any power out to the fans. I have connected the jumpers for 12v fan output and 12vEN. It rather sounds as though the 12V regulator isn't working. Do you have a 24V fan you can test with? If so please try using that with the fan voltage jumper set to VIN to check that it's not a problem with your configuration. Thanks for getting back to me. I’ve now tried that, I am still getting nothing. The area above the 12vEN selection pins looks unuusual to me. Is there an electrical component missing? There is solder on there but no components? The area above the 12VEN jumper has space for 2 resistors. One should not be fitted, the other should have a 0 ohm resistor fitted, although I think on some boards there may be a solder bridge instead. If the Duet is detecting the DueX2 (as shown by the M115 response, or by the Settings general page of DWC) then those two positions are correctly populated. How are you testing the fan outputs? Have you tried more than one of them? PS - are you certain that you connected the + and - fan wires the right way round? Ok, cool, thanks for clearing that up. I have transferred a working 24V fan from the main board to the duex2 and it works on the wifi, and is dead on the duex2. The Firmware elctronics section of the DWC shows “ Duet Wifi 1.0 +DueX2”. Vin is showing as 24.4V on the DWC. The fan is connected correctly. I tried both ways:) I have plugged that 24v fan back into the DuetWifi and it continues to work. Just to clarify, for VIN (24v Operation) the 12VEN jumper should be not connected and the VIN selection jumper connected. For 12V, The 12VEN Jumper should be connected and the 12V selection jumper, should aslo be connected? Sorry, I forgot about your second question. Im testing the fan outputs using a number of working 12v and 24v fans. All of the fan outputs appear to be not working. So what is the RCOA? In-warrenty replacement? It's an odd fault, but I can't think of anything else to test to shed light on it. Please see https://www.duet3d.com/warranty. I recieved the new board today and found it to be exactly the same…....then it hit me.........the issue is with me.....I assummed wrongly that these were always on fans......I feel really silly now. Why would they be always on fans?? I am sorry for wasting everyones time. Thanks for all your help as always! I appreciate it alot. For the record, I dont believe the documentation was mis-leading in any way. It says controllable, I assumed that just meant that you could select the voltage. Obviously they have to be controllable through the code for the outputs to be useful for the additional extruder/heater combos and their respective part or hot-end cooling fans. I missed the blindingly obvious. It wouldnt be the first time. I’m sure the majority of people, perhaps everyone apart from me understood what controllable meant. 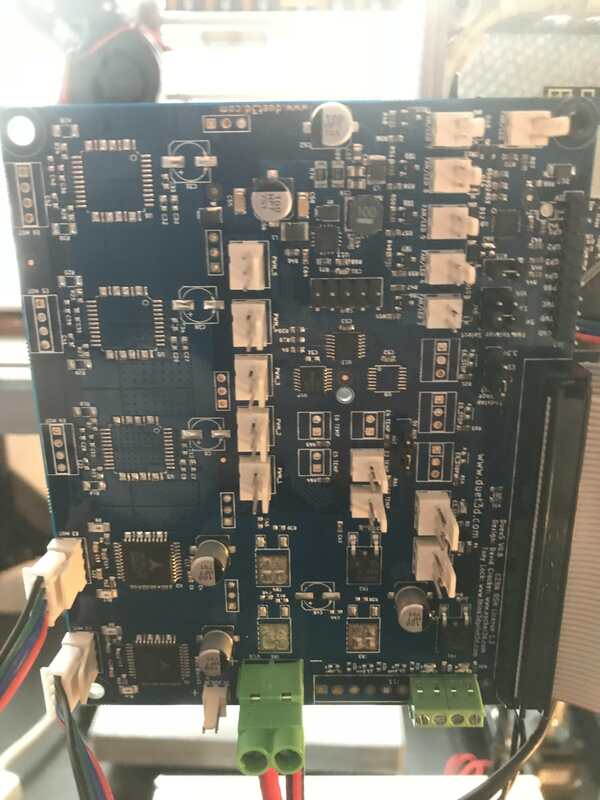 It may be worth adding the word “PWM” in front of the word “controllable” to align the terminology between the descriptions of the duet wifi and duex 2 expansion board. Keep up the great work, massive fan!